Thanks, Rick. We sometimes do star trails in the workshops that don’t include a full moon (we’ll have an opportunity at next year’s monsoon workshop). It’s harder than moonlight because it’s so difficult to compose and focus in such darkness. Hi Gary, You’re really pulling my chain with these images. I’ve been trying to talk myself into the Sony a7r, but haven’t been able to pull the trigger. Mainly because of doing night photography. I think these two images just may be the tipping point. Thanks for all your posts on the camera, etc. 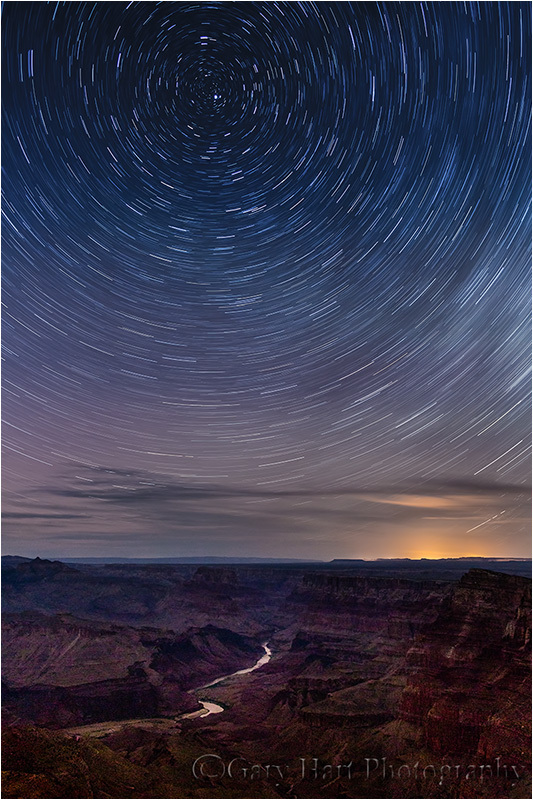 The Desert View star trail image was captured with my 5D Mark III, but I’m loving my Sonys. I’m pretty confident that the a7R is better at the high ISOs than the 5DIII, but it doesn’t compete with the a7S that I used for the image I posted today. Don and I just wrapped up his Northern Arizona workshop. I used all three of my Sony bodies on the trip: the a7R was my primary body; the a7S was for the night stuff; the a6000 I used for close focus poppies and as a second body in Upper Antelope Canyon (without a lens it fit in the back pocket of my jeans).